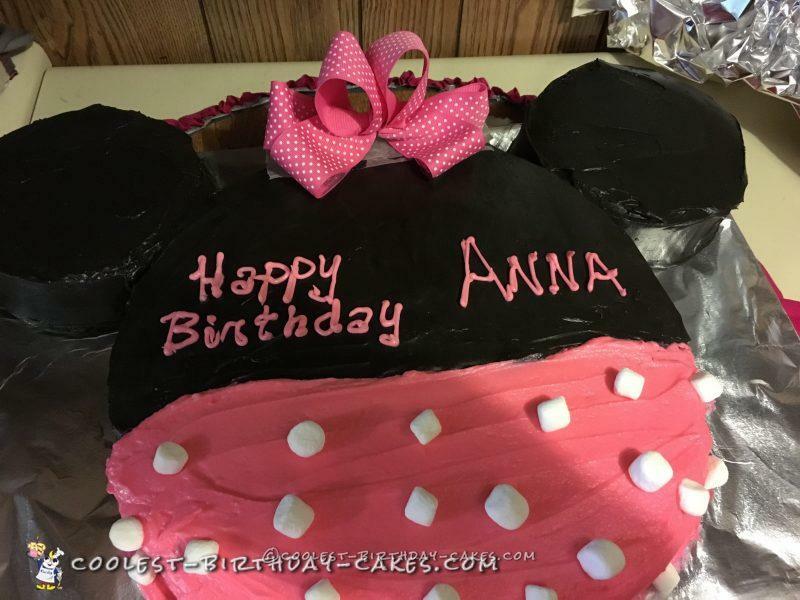 I saw this on Pinterest and knew my great niece would like a Minnie Mouse cake for her fourth birthday – she loves Mickey Mouse Clubhouse. This was a last minute cake – I received notice of the event the night before at nine for a next day event at my house at 5 pm! Whew! I pulled out my 12″ round and 6″ round wedding cake pans (2″ deep). I used a large oblong cutting board instead of a corrugated cake board to be sure the cake would all fit. I mixed up two vanilla cake mixes for the 12″ round (the body) and 1 milk chocolate cake mix for the 6″ round (the ears). Note: I had about two cups of vanilla batter and 1/2 cup of chocolate batter left over. 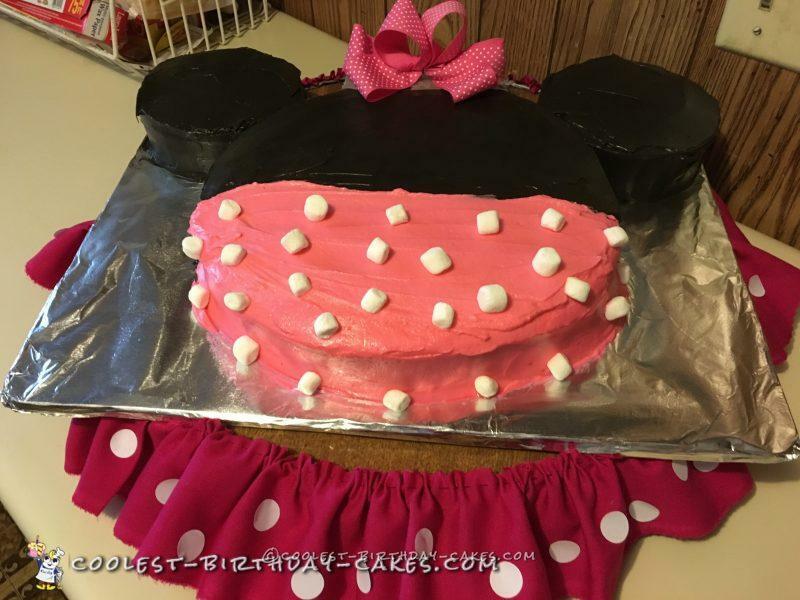 I purchaed two containers of chocolate fudge icing for the ears and mixed up some buttercream icing using 1 pound of confectioners sugar and Wilton’s recipe and tinted it pink for the skirt. The white dots are marshmallows. The hardest part was icing the ears while they are sitting near the body. I made a ruffled skirt from fabric and added white round stickers to it – stuck it to my lazy susan with rolled up duct tape then put the cake on it. I made the bow with some pink dotted ribbon and floral wire. I put some wax paper on the cake to keep the ribbon out of the icing. I almost forgot to write her name on the cake – lol – and grabbed my icing bag quick! We put the candles just above her name. My niece was so excited when she saw her cake she immediately started pulling marshmallows off the skirt! 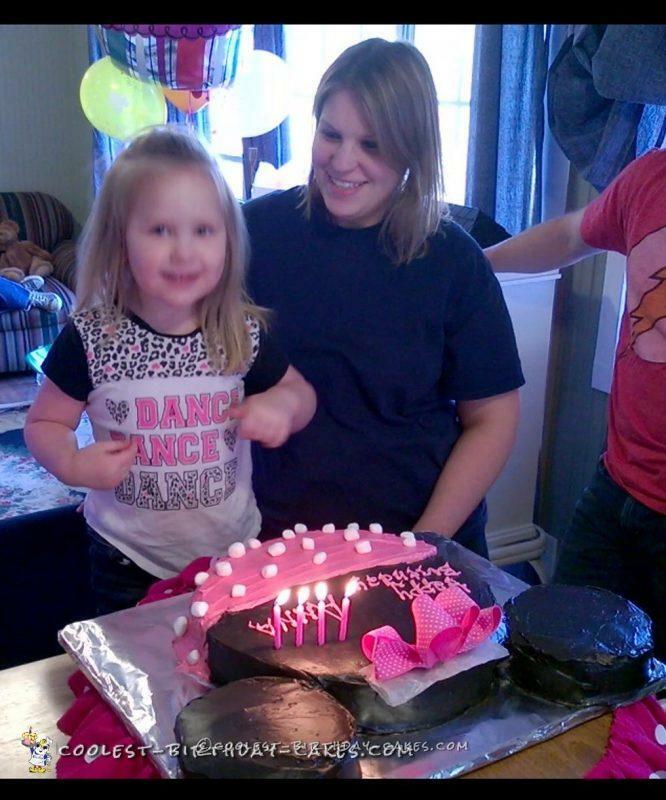 She insisted we cut her daddy a piece of cake – and he’s deployed! 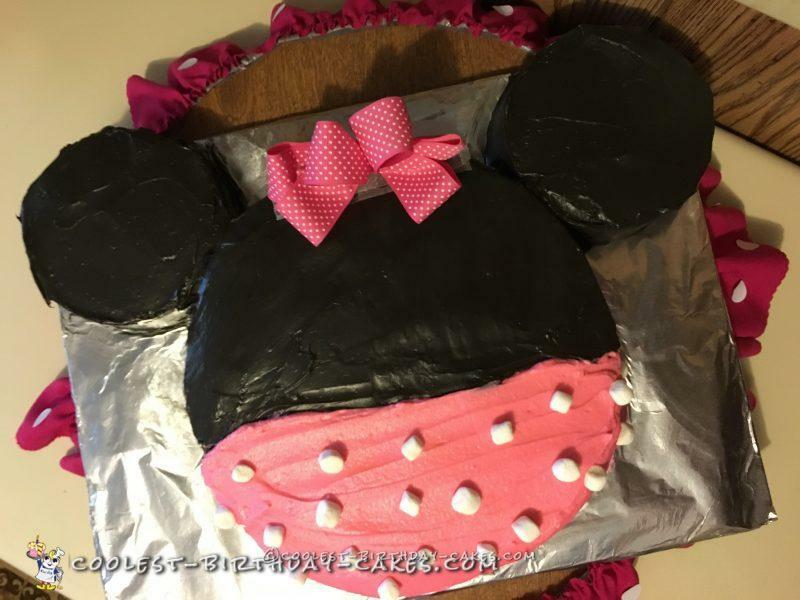 Birthday cake idea posted by Carol B.